Blessed with 45 miles of magnificent Pacific Ocean shoreline, Orange County, CA welcomes thousands of visitors each year to its famous beaches. Many people enjoy living in one of Orange County's coastal communities because of the year-round welcoming weather, picturesque sunsets, and artistic charm of the beach. Whether you are searching for a new luxury home in Talega, a harbor view home near Dana Point harbor, a charming custom house in San Clemente, a prestigious luxury estate in Newport Beach, or a property with equestrian facilities in Newport Beach, you will find it on this page. Orange County's coastal, ocean, and beach area real estate include single family homes, luxury mansions, condominiums, and land, for sale, lease, and rent. Homebuyers can choose from homes with spectacular ocean or whitewater views, shoreline or waterfront locations, canyon areas, and charming cottages and rustic bungalows. Use the home search links below to find Orange County real estate at the beach. this includes homes for sale, lease, lease-option, or rent. The searches include Orange County, California coastal area MLS links. These include links for pet-friendly leases, REO / Bank Owned properties, ocean view home rentals, orange county, ca, single story or single level homes, and horse properties. Also, pool homes, estates, and buildable lots and land, in Dana Point, Huntington Beach, Corona del Mar, Laguna Beach, Newport Beach, Newport Coast, Seal Beach, and San Clemente, CA. Corona del Mar ("Crown of the Sea" in Spanish) is a luxury sub-division of Newport Beach. This beautiful coastal community includes many condos, town homes, single family homes, houses overlooking Newport harbor, and ocean view custom homes for sale, lease, or lease option. Newer developments in Harbor View Hills consist of California ranch style houses, many with expansive ocean views. Recreational amenities include Corona del Mar State Beach. It's a popular place for swimmers, surfers, and divers. The half-mile long sandy beach framed by cliffs and a rock jetty that forms the east entrance to Newport Harbor. Use the following links to find Corona del Mar real estate, homes, and land. The beautiful city of Dana Point, CA is home to 36,765 residents and is characterized by nearly seven miles of prominent coastal bluffs and rolling hills along the Pacific Ocean. Points of interest include Dana Point Harbor, Salt Creek and Doheny State Beaches, and the Ocean Institute. Dana Point homes and real estate include single family homes, custom houses, town homes, condominiums, and land, in the beautiful ocean side communities of Capistrano Beach, Monarch Beach, Del Obispo, Dana Hills, and Lantern Village. This city is a great place to start if you are looking for South Orange County ocean view homes or condos. Links below are foe Dana point homes for lease and Dana point homes for sale. If you would like a home for lease in a specific area of Dana Point such as Capistrano Beach, Del Obispo, Monarch Beach, Dada Hills, or Lantern Village, please contact me. Known all over the world as "Surf City", Huntington Beach includes eight miles of sandy beaches, funky surf shops, and the famous Huntington Beach pier. Huntington Beach homes and real estate include single family homes, town homes, condominiums, and land, in Northwest, South, and West Huntington Beach. Note: Sorry, leases in the city of Huntington Beach will no longer be listed on my site. The reason is that many HB landlords and their listing agents are offering extremely low commissions to tenant's agents. These commissions are often well below our actual costs to show homes, pay for gas, and pay our brokerage. In my opinion, the landlords and their agents in Huntington Beach do not "get it", and as long as this unfortunate trend continues, I will not include these properties on my website. I advise my clients to look for homes for lease in other cities! Leases in Huntington Beach will no longer be listed here! Laguna Beach is known for its picturesque shoreline, art galleries and annual attractions such as the Pageant of the Masters and Sawdust Festival. Laguna Beach real estate is divided into four separate areas, including Laguna Canyon, Laguna Village, and the North and South locations. Homes in Laguna Beach include rustic hillside homes, charming cottages, and luxury homes and houses with ocean views. Use the links below to find bank owned homes, Pet-friendly leases, pool homes, and homes for sale, lease, lease-option, or rent. If you are looking for a home for sale or lease in a specific area of Laguna Beach such as Laguna Village, Laguna Canyon, or north/south Laguna, please contact me. The crown Jewel of Orange County's coastal communities, Beautiful Newport Beach contains many points of interest, including Newport, Balboa Peninsula, Lido Isle, and nearby Fashion Island, with its 200 specialty stores and 40 restaurants. For many residents, nothing tops the prestige of a Newport Beach mailing address. Use the search links below to find homes and real estate in Newport Beach and Newport Coast, including single family homes, condos, custom homes, town homes, leases, rentals, and lots or land. Newport Beach real estate includes several areas. These are Corona Del Mar, Balboa Peninsula, East Bluff, West Bay, Lower Newport Bay, and Newport Heights. If you are looking for condos in Newport Coast, you will find them below. The southern most coastal city in Orange County, San Clemente is famous for its surfing, and as the former location of the "Western White House". San Clemente's newest area is Talega, a development of large, single family homes. Many vintage custom homes are located in South West and South Each San Clemente. There are over 25,000 homes in San Clemente. These include condos, town homes, single family homes, custom homes, luxury homes. Also, estate properties with ocean and whitewater views. Links below are for San Clemente homes for lease and San Clemente homes for sale. See my main San Clemente page here. Seal beach is Orange County's northern most beach community. 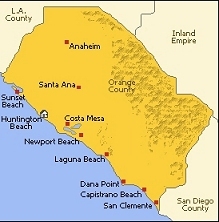 It is bordered by Los Angeles to the north and the city of Huntington Beach to the south. It is home to the United States Naval Weapons Station. The city includes the small gated community of Surfside Colony, plus Leisure World, a gated retirement community. Links below are for Bank owned homes, retirement community, and pet-friendly leases in Seal Beach. Also condos and town homes and single family homes for sale and lease in Seal Beach. Ocean View homes for sale and lease List your home "for sale" List your home "for lease"
I hope you found my page to be of value in your coastal home search. Please don't hesitate to call me if you would like more information on any homes you find through this page. Can't find what you're looking for? Call or e-mail me and I'll send you listings of homes that fit your exact requirements. Whether you are buying, selling, leasing, renting, or relocating to beach area and coastal homes in Orange County, CA, I am always available to show you homes. I'll be glad to assist you with your sale, purchase, relocation, or lease.